I look forward to sharing photos and enjoying yours! 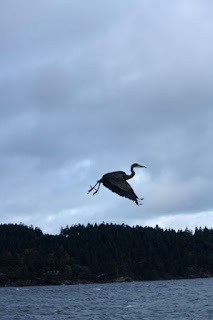 On October 22, in the Sounder, I read about the three raccoons found dead and the Great Blue Heron found shot with a BB gun or pellet gun on the north end of the island. The heron was still alive but died of its injuries a day later at North Island Wildlife Recovery Centre in Errington. The GROWLS volunteer that took it to Errington suspected it was near starvation after being unable to hunt for two or three weeks. 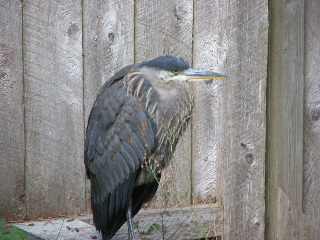 Great Blue Heron found in islander's back yard. 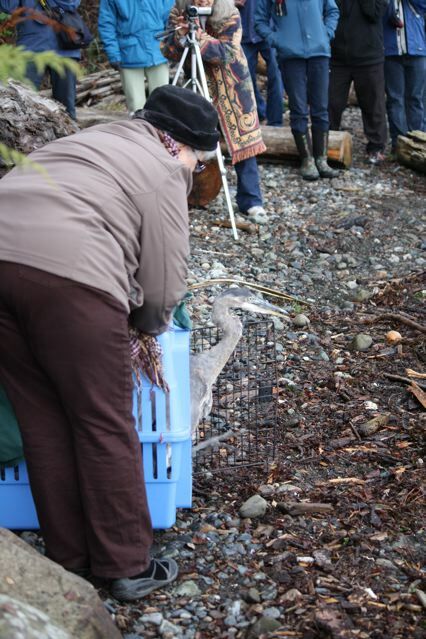 Then, October 23, GROWLS volunteers and friends gathered to release a different Great Blue Heron that had been rescued by GROWLS volunteers some time ago and taken to North Island Wildlife Recovery Centre in Errington. There, the heron was treated and recovered nicely. On the 23rd it was returned to Gabriola to be released close to where it was found, near Sandwell Beach. Great Blue Heron being released from cage. Photo by Tawny Maclachlan Capon. 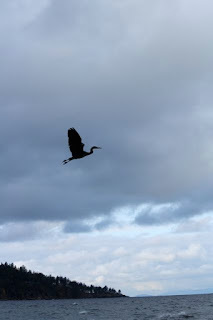 Into the wild blue yonder. Blessings to you. So, while many people on the island actively honour and care for our wildlife, others - or at least one other - is killing them. So sad. Thank you to GROWLS and North Island Wildlife Recovery Association in Errington. Once a month I walk the shore of Brickyard Beach checking for dead birds. No, I don't have some kind of avian vampire streak that raises its head with the new moon. I do the monthly beach walk as a volunteer participant in The BC Beached Bird Survey, a research project of Bird Studies Canada. What's a Beached Bird Survey? 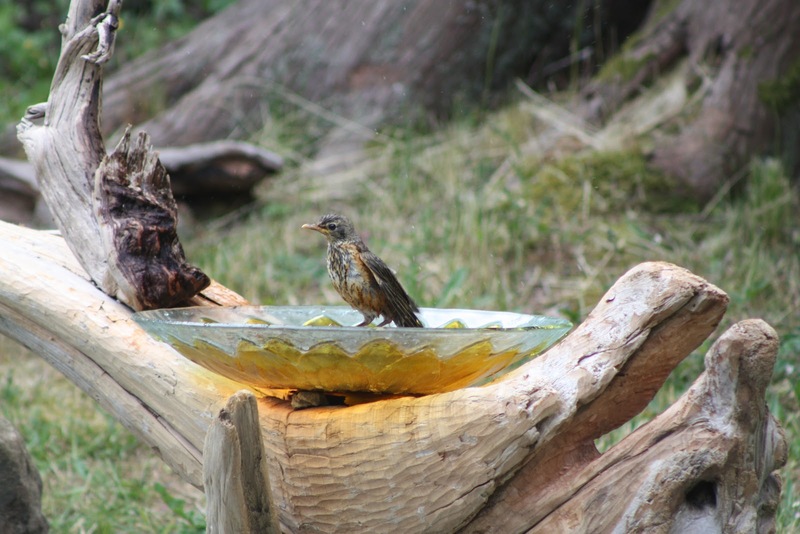 The BC Beached Bird Survey collects baseline information on the causes and rates of seabird mortality. Volunteers do monthly beach walks along selected beaches (such as Brickyard) looking for seabird carcasses that have washed up. After taking measurements and photos we tagged the bird's wing. The tag tells us that this particular bird has already been identified so we don't count it again next time, skewing the data. 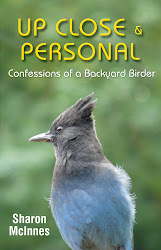 If we do encounter the same bird again, we submit data on the rate of deterioration and scavenging to Bird Studies Canada. If you happen to see a dead bird at Brickyard Beach with a tag attached to it, you'll know it's been identified and is being tracked by the BC Beached Bird Survey. If you have any questions feel free to comment below. And for more information about the Beached Bird Survey in general, please email bcprograms@birdscanada.org or call 1-877-349-2473.